New Year’s Eve is an occasion when people may have a little tipple. Some tipple a lot. And an unfortunate few tipple way too much. New Year’s Day? That’s when some of those poor over-tippled souls desperately search for a remedy to soothe their aching beings. Some swear by “hair of the dog” remedies. The idea is that drinking more booze can cancel out a hangover — or at least dull its pain. There is a longstanding tradition of such potions. “The cocktail canon is lousy with bracers, glom-lifters, eye-openers and corpse-revivers” wrote Eric Felten in his December 27, 2008 Wall Street Journal column, “How’s Your Drink?” (subscription may be required to access link). He’s referring to entire classes of mixed drinks (most dating from the nineteenth and early twentieth centuries) that were concocted solely to relieve overindulgence. The “corpse-reviver” was one such class, so named because it could — figuratively speaking — bring a drinker back from the “dead.” Today the most commonly known example from that school is the Corpse Reviver #2, a drink that essentially was forgotten after Prohibition, but has become popular again as interest in classic cocktails has exploded. The Corpse Reviver #2 is so named because that’s what Harry Craddock called it (there are two other versions of the drink, but #2 is by far the tastiest). Craddock was a famous American barman from the 1920’s and 30’s who left the States during Prohibition, moving to London to work at the Savoy Hotel. Even if Craddock didn’t actually invent the drink, we remember it because of him. He wrote about it in his 1930’s classic, The Savoy Cocktail Book, which has been reissued in a new edition. Craddock’s opinion of the drink? “Four of these taken in swift succession will unrevive the corpse again.” A warning that even the best medicines can have unfortunate side effects if taken in excess! Combine ingredients in a cocktail shaker half-filled with ice. Shake well for 20 – 30 seconds. Shaking with ice somewhat dilutes the drink with water, which adds an important dimension to the final flavor. Fresh lemon juice is difficult to incorporate into a drink merely by stirring, so shaking is the preferred method for mixing any drink that contains citrus juice. 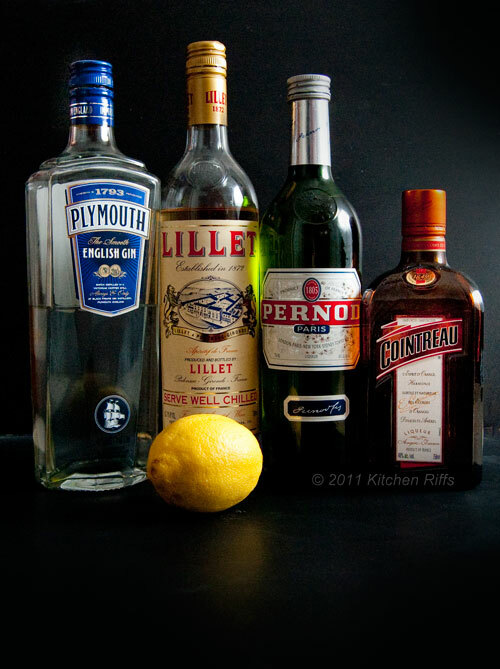 Perhaps the most important aspect of this drink is the ratio of ingredients: 1 part each of gin, Cointreau, Lillet Blanc, and lemon juice, with a very small quantity of pastis to taste. I recommend ¾ ounce measures because this produces a somewhat smaller drink, which I prefer. Other recipes may call for an ounce or more of each ingredient. Mix the drink to fit your preference (and the size of your glass). I prefer smallish cocktail glasses (4 ounces or so). Cocktails should be served cold and should remain cold while you drink. It’s far better to prepare a smaller drink that will remain cold as you sip. If you want more, you can always prepare another fresh cold round. That way your drink is always at its best. Most cocktails taste better if the ingredients are measured rather than poured by eye. Balancing the various ingredient flavors is part of the skill of the mixologist (in the Corpse Reviver #2, the pastis is particularly difficult to balance). For measuring small quantities, I prefer the 2 oz Oxo brand angled measuring cup (pictured above) rather than the more traditional jigger. The angled surface lets you read the measurement from above, which is very handy. Lillet Blanc is an aperitif wine from France. It was reasonably well known in the United States in the 50’s and 60’s, but in recent decades has become far less common. A good liquor store should either have it in stock or be able to obtain it. The alcohol content of Lillet is relatively low, so once the bottle is opened you should store it in the refrigerator to prolong its life. Since Lillet is intended to be an aperitif, you can serve it chilled in a wine glass as a pre-dinner drink. Sources: Craddock was my source for variation #1. Robert Hess (aka Drink Boy) was the source for #3. His website is well worth your attention. The Corpse Reviver #2 is delicious, but should you actually drink it to, well, revive yourself the morning after the night before? Is it a good substitute for “morning drinks” like the Bloody Mary or the Mimosa? Probably not. 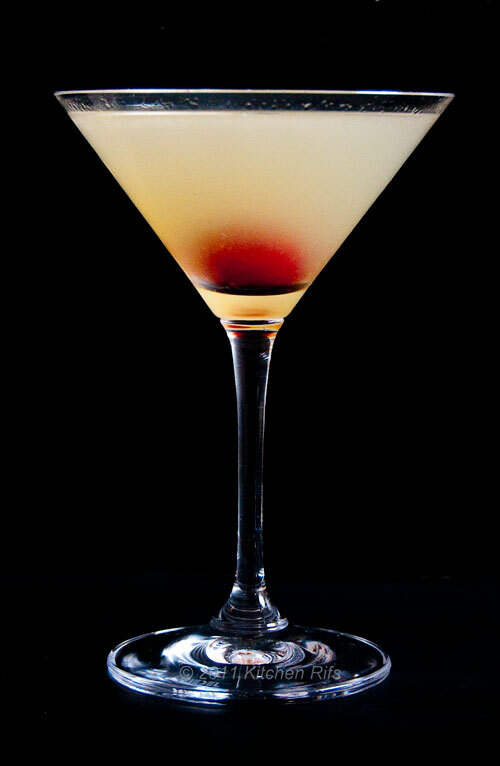 The Corpse Reviver tastes better as a cocktail than as an accompaniment to brunch. It works best with an appetizer or a bowl of nuts. More importantly, Bloody Marys and Mimosas can be made into fairly sizable drinks without a proportionate increase in their alcoholic content. The Corpse Reviver? Well, you’d have to drink four to get the quantity of liquid you’d find in a Bloody Mary. And Harry Craddock warned us about what happens when you imbibe four of these beauties, particularly in quick succession . . . .
One place the Corpse Reviver #2 does pair is with a nice, spicy bowl of cajun gumbo! The absinthe works nicely with flavors in the chicken, shrimp and andouille. (I also sometimes make my gumbo with seafood sausage and use a gluten-free roux made from rice, millet and garbanzo flours. In addition to the usual, seasonings include angostura bitters and onions cooked in bourbon/rye. CR#2 plays very well with those flavors. Hi Sc'Que?, a Corpse Reviver & gumbo does sound like a great combination. I never thought of use bitters (or cooking my onion in bourbon or rye!) - interesting idea. Thanks for your comment. Hi Anonymous, I've never had Fernet Branca, but that certainly sounds like an interesting idea. I take it you enjoyed the drink made that way? Thanks for the comment.